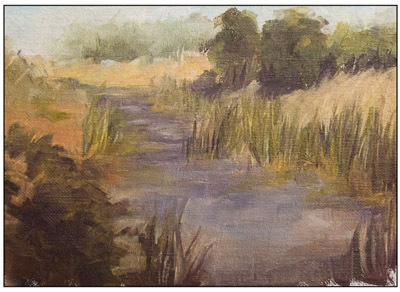 Plein air painting showing atmospheric perspective. 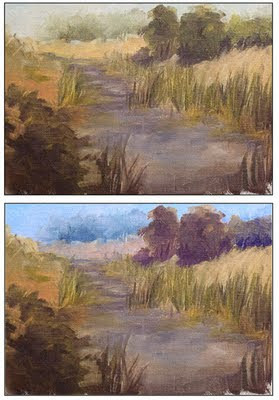 When painting a landscape, visual perspective is an important element of creating a successful image. This will include considering where to place the horizon line and the two point perspective guides. Along with that, there is one more thing we need to consider when painting a scene covering a large distance. 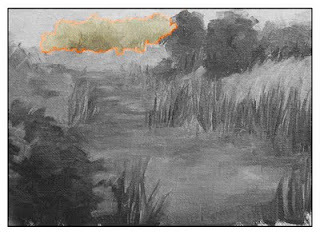 That is how the conditions of the atmosphere affect the elements in the scene, what is called atmospheric perspective. Today, we will look at how to create atmospheric perspective, so that we are able to describe what it is to start using the guides in effectively painting a landscape. What is atmospheric perspective? It is the visual impact that the atmosphere or air has on the look of a scene or the objects found within the scene. As you may note, the sky does not appear empty. We can see the sky by looking up and seeing its color above us. Up close the air appears transparent and empty. We can see things unobstructed by the atmosphere. Looking up into the sky the air loses this transparent appearance and takes on color. This effect is because of the the many particles in the sky that are reflecting the light from the sun and obscuring what is behind them. This effect occurs throughout a scene with less and less intensity as the objects move closer to us. The further away an object appears from the viewer the more the sky will impact its appearance. The same object will take on different qualities depending on its location in the scene. 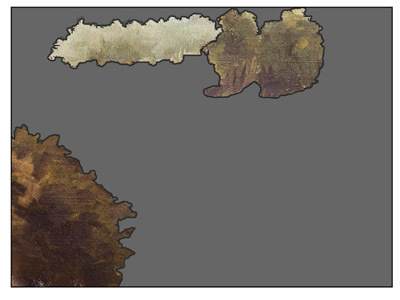 This is because there is more atmospheric particles between the viewer and the object as it moves back in the scene. 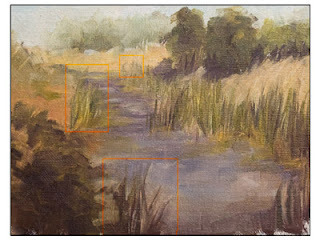 The atmosphere will compress the contrast, lighten the value, change the color, and soften the detail of an object the further back it sits in the scene. The value range in the background it the most compressed. The contrast in value levels between the lights and darks found on an object shrink the further back it is set in the scene. have a wider value range. If the object is up close to the viewer the value range may span the full range, from white to black. As we move the object back in space this difference diminishes until the lights and darks are close to similar in value. In short, more value contrast up close, less far back. The foreground has the widest range in values. The images to the right show an example of the compression of value. The first image highlights the trees in the background, the second, the middle ground trees, the third, the bushes in the foreground. The shadows of the trees in the background have a low contrast to the light side values. The contrast is greater in the bushes in the foreground. Not only does the contrast get reduced but the objects will appear lighter the further back they are in the scene. This is because the air is slowly starting to obscure the object. The values of the object appear to take on the general value of the sky. Think of the atmosphere as a kind of a fog slowly settling in over the landscape. In the distance there is more of this fog between the viewer on the objects, making it more difficult to see. In short, the objects should appear lighter the further back in they are from the viewer. The color of the objects will begin to shift in a scene when they move back into the distance. Again, that is because of the "fog" of the atmosphere. The objects will start to take on the color of the sky as more of the atmosphere gets between the viewer and the objects. If the sky is blue then the objects in the background will take on a more bluish hue. In short, the color of an object become more similar to the color of the sky the more distant it is from the viewer. To the right is an image exaggerating the color change effect caused be the atmosphere. The objects in the distance appear more out of focus when compared to the objects in the foreground. This means the edges are softer in appearance and the details describing the objects are fewer. Take a look at the three groups of plants highlighted in the image to the right. The plant life in the foreground are the most sharpest and have more information describing the plants. In the middle ground there is still some detail but the forms are less defined. In the background these forms lose most of their descriptive information and almost become just one single form. In short, simpler fuzzier versions of the objects are found in the background. Using these guides well help you create a better sense of depth and space. This is because it ties the appearance of the scene in the painting to how we see our environments in life. It gives the viewer enough of what they expect to see to give the painting a sense of realism.